Art Events Season in full swing with Peep Show, DRAW, Get Behind the Arts, and more! So much to do and see in Downtown Racine. Hope to see you soon! Check out the image gallery below to see a couple of the fresh new pieces we’ve been working on for spring. And be sure to visit our events page to see all of the wonderful things that our Downtown has planned for the upcoming months! Cheers, and see you Downtown!!! We are so very thankful for all of our Customers, Family, and Friends! We appreciate you thinking of us for your holiday shopping needs. Being able to create special items for the wonderful people in our community truly brings us so much joy. We’re hoping that each of you have a happy and healthy Holiday season, and we look forward to what 2019 brings!!! Lots of Fun Events this Holiday Season! The Holiday season is just getting started in Downtown Racine! Following is a list of the fun things we have to look forward to in the next couple months. Stop in the store or call 262-633-0545 with any questions about the upcoming holiday season. See you Downtown!!! Wish List sign-ups receive choice of one complimentary glass of Uncorkt Wine or Beer. No purchase necessary! New work from in-house artists. Limited Edition release. Gift with purchase, in-store specials, refreshments and hors d’oeuvres. In-store specials, refreshments, and raffle. As the summer weather leaves us, here at AMS we are looking forward to all the fun that the end of the year brings to Racine. Be sure to check our events calendar page for a full list of events and details about the upcoming end of year festivities. See you Downtown!!! July 8th - 14th: Shop is CLOSED for our annual family Summer Break. We appreciate your understanding and apologize for any inconvenience. July 15th: Back in the shop with regular summer shop hours! Dog Days of Summer are HERE!!! The 2018 Public Art exhibit in Downtown Racine has begun! This year the theme is K-9 Heroes, a tribute to the police dogs of Racine County. Look for these lovely sculpture outside of your favorite shops and galleries on Main Street and Sixth Street. See you Downtown!!! Click here for more information about the public art project! Contemporary Mokume Gane - Guest Artist Collections thru June 10th at Art Metals Studio! 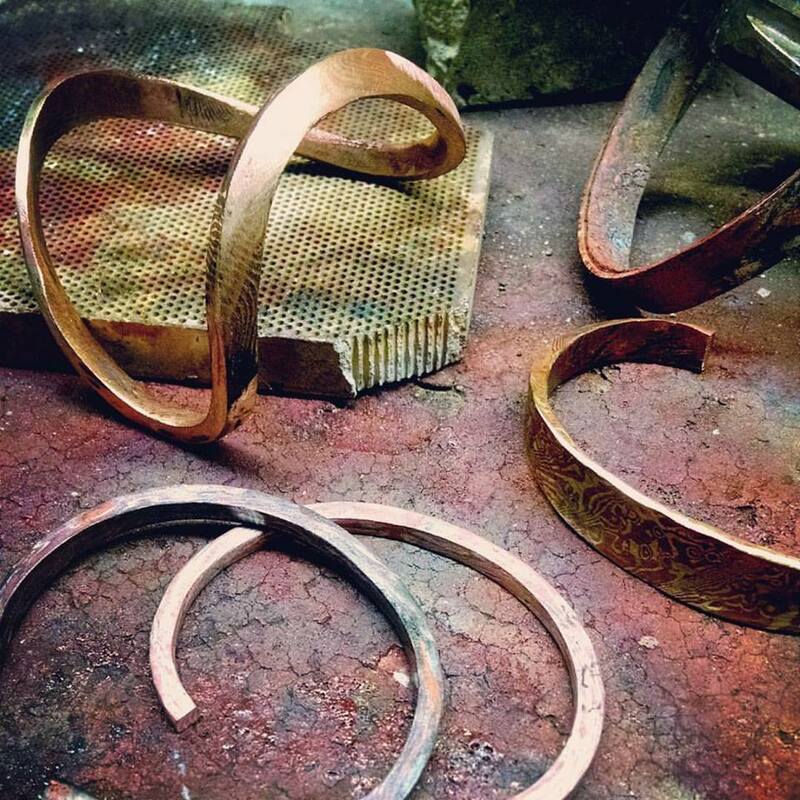 This First Friday (June 1st) thru June 10th (Sunday) Art Metals Studio will be showcasing the art of several regional and national artists working in Mokume Gane, an ancient Japanese metalsmithing technique. In addition to our own collection, we will be showcasing the work of U.S. artists David Barnhill, David Huang, Theresa Kwong, Julie Sanford, James Binnion, David Doran, and Julie Papageorge. Make sure to also visit the Japanese Studio Craft exhibit at the Racine Art Museum, and enjoy free RAM admission on First Friday! Welcome Boaters, Tourists, Locals, and Day-Trippers! We have so many wonderful happenings going on in Downtown Racine this summer, be sure to check the calendar page on our website for more information. If you wish to start a custom jewelry project this summer, click the contact us link on our website to set up a consultation today! Join us for D.R.A.W. on April 21st! Click here to see local artists, including our very own Chris Sklba, talking about the DRAW event on Fox 6 Milwaukee! The Downtown Racine Art Walk is coming up quick, and we're so excited to share the new things we've been working on! Saturday, April 21st from 4-8pm, stroll the streets of Downtown Racine and check out what this wonderful art community has to offer. Stop in AMS (332 Main Street) for fun and refreshments, and stay to see examples and demonstrations of a few of the techniques we use in our workshop! See you Downtown!!! Click here for more information about this wonderful event! Celebrate the return of First Fridays! It's almost April, and that means everyone's favorite Downtown event, FIRST FRIDAY, is kicking off! Friday, April 6th, test your Gem knowledge by playing “Know Your Bling”!!! In honor of April's Birthstone, Diamond, we're holding another gemstone guessing contest. Stop in the store on April 6th, from 10am - 9pm, and try your hand at Diamond identification! Guess which stone is Diamond from the contest tray to be entered into a drawing for a super-sparkly AMS Diamond pendant! Guess wrong? AMS's knowledgeable staff will be there to educate you on how to tell the difference in the future. One guess per customer. The winner of the drawing will be announced on Saturday, April 7th. Shine on!!! See you there! Diamond rings by Art Metals Studio. Personalize an Item for Your Sweetie! Let them know how much you care and how thoughtful you are by personalizing your item! Many of our in-stock jewelry pieces can be personalized and engraved SAME DAY. Just ask in-store about different available styles and make your Sweetheart's day! Below are just a few examples of in-stock items that have room for a personal message, name, or date! Click through the gallery or contact us to see more. Fire and Ice Festival on Monument Square plus Restaurant Week Kick off! On Saturday, January 20th, Downtown Racine is hosting a winter party that is NOT TO BE MISSED! The Downtown Racine Fire and Ice Festival is a FREE public event, with FREE outdoor Ice Skating on the square and FREE skate rental between Noon-5p. There'll be ice carvers, art and craft vendors, food trucks, and more! Click here for more information. Click here to view the event on Facebook. January 20th is also the kick off date for Downtown Racine Restaurant Week! January's Birthstone, Garnet, is an easy favorite. We have many variations of Garnet available in-store now; in deep Mozambique reds, sparkly Rhodolite pinks and purples, juicy Spessartine oranges, and even Tsavorite greens! Call or stop in to see what we have for you!!! Click here to learn more about Garnets and their mineral makeup. Let us be your shopping guides! Does the person on your shopping list have a favorite "lucky" gemstone? Want to know the perfect AMS jewelry item to have engraved? Looking for a specific size or style? WE'RE HERE TO HELP! Feel free to call ahead (262-633-0545) or ask in-store for special assistance. We're happy to guide you in finding the perfect gift for everyone on your list. And as always, we offer FREE Gift Wrapping every day! See you Downtown. Happy shopping!!! Holiday shopping in Downtown Racine, 1962. Image credit www.RacineCounty.net click here. Gent's Brew-town Prize Basket Weekend and the Downtown Racine Holiday Open House! ALL purchases this weekend (December 7th-10th) will be entered into a drawing for a Gent's Brew-town Prize Basket. The basket includes an assortment of Downtown Brew gift certificates, a glass Growler, AMS pint glasses, and more! This weekend we will also be celebrating the annual Downtown Racine Holiday Open House on Saturday, December 9th. See you Downtown!!! Join us this First Friday, December 2nd as we celebrate you, our customers. Stop in between Noon and 8 PM for a chance to win up to a $100 gift certificate. Specials and refreshments from 5-9pm. Also, receive a gift with purchase you'll be sure to enjoy! See you soon! With November at our doorstep, our attention turns to Holiday Custom orders. As artists and designers, this is our FAVORITE time of year! Creating meaningful jewelry for our clients is a joy, and we feel honored to be a part of your celebration. Clients looking to have a piece made for the 2017 Holiday season should have their orders in NO LATER than December 2nd. If you are new to the Custom Order process, click here to learn more. Contact Us or call 262-633-0545 for more information. Custom Earrings created by Christopher Sklba. Diamond, Pearl, and 14K Yellow Gold. 2017. Mind-Body-Spirit.....and Jewelry; Can wearing certain gems or jewelry designs actually influence how you feel at a much deeper level than you thought? Ever wonder why you seem to be attracted to certain gems or types of settings? Throughout the ages, distinctive pieces of jewelry with specific gemstones were worn not only for their beauty but were thought to carry an energetic property or "medicine " that would amplify desired properties such as strength, protection or abundance for the person wearing it. Modern research on Mindfulness affirms a connection between what we think and how we feel... but is it all just thoughts in our head? And even if it is, do our thoughts really influence how we feel? We will have fun exploring various opinions and lore on the energetic resonance of gems, their colors, their symbolism, and certain indigenous spiritual beliefs on their meanings. Our speaker, Kristie Zahn, has traveled the world, spending time in study at Ashrams in India, with Peruvian elders in the Rainforest, and with Native American medicine people learning the beliefs and nuances of spirituality. She is a Board certified chaplain, and teaches classes in Mindfulness and stress management/meditation in southeastern WI. She will share some interesting ideas on how wearing certain jewelry/gems might just enhance your well-being in surprising ways.